Today's list... one each of Spotted Sandpiper, Pectoral Sandpiper, Greenshank, Curlew Sandpiper, Ringed Plover, Little Ringed Plover, Common Tern, Hobby, Ring-necked Duck, Ferruginous Duck, Common Tern and Nuthatch. Two Common Sandpipers, three Wheatears, three Siskins, three Dunlin, four Yellow-legged Gulls, two Pochard x Ferruginous Ducks, three Little Stints, one Whimbrel, 14 Little Egrets, three Black Terns, two Knot, three Ruff, two Green Sandpipers, two Redshank and 70 Lapwings. The adult Spotted Sandpiper was still on the dam wall at Herriott's Pool today, and a juvenile Pectoral Sandpiper was found in Stratford Bay; our third of the autumn. Other waders seen were one each of Common Sandpiper, Little Stint, Redshank, Ringed Plover and Little Ringed Plover, and four Ruff. The male Ferruginous Duck was again on the spit in front of Stratford hide, and a Yellow Wagtail was heard over Herriott's Bridge. The small wader clear-out has just about seen the last of the calidris and pluvialis flock at Chew; just three Ringed Plover could be found today. It wasn't all outgoing news though, a surprise find this afternoon was a moulting adult Spotted Sandpiper on the causeway at Herriott's Bridge (the third Chew record). It favoured the north-west corner of the pool, and only once was seen to venture as far as the lay-by, preferring the distant dam wall under the hedge, proving difficult to see due to the plants growing in the concrete. 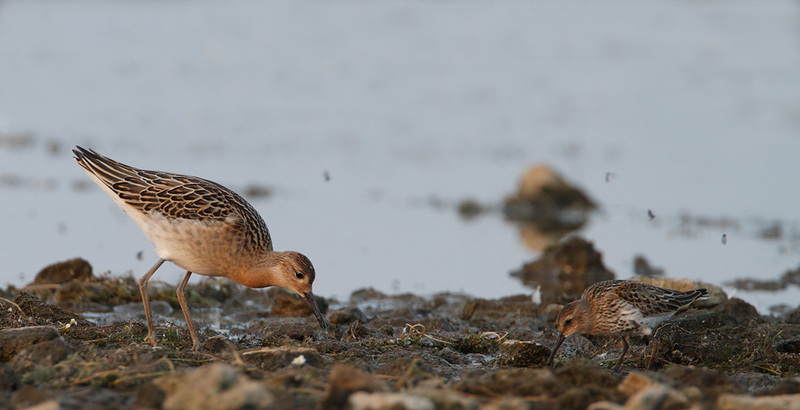 That's our fifth American wader of the autumn. Remarkable. Other waders seen were two Common Sandpipers, three Redshank and three Ruff. The male Ferruginous Duck and a male Ferruginous Duck x Pochard were on the spit in front of Stratford hide, and a flock of 21 Black Terns arrived this afternoon. 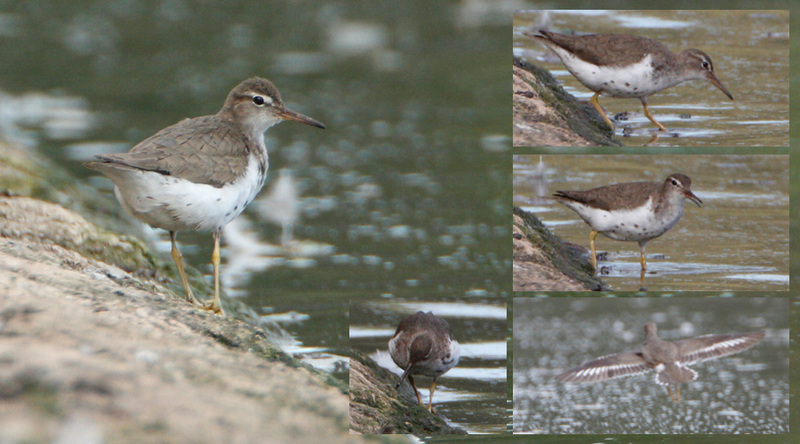 Considering its location, the Spotted Sandpiper at Herriott's Bridge was very difficult to view this afternoon. The 31st species of wader seen at Chew this year. Evidently there has been a departure of some of the smaller waders since Wednesday; only 11 Ringed Plover, two Little Stints and five Dunlin remained, with other species represented by one Little Ringed Plover, two Curlew, three Ruff, four Redshank, one Greenshank and two Green Sandpipers. Other birds seen were eight Little Egrets, 15 Pintail, one Ferruginous Duck, one Yellow-legged Gull and one second-winter Mediterranean Gull. Sorry for the recent break in transmission - good job I didn't miss anything good whilst I was away. I'll update the current stuff from today onwards, but the other September news will be uploaded at a later date when I get round to it. The male Ring-necked Duck and Ferruginous Duck were both still present in Stratford Bay today, as were two Black-necked Grebes. Also around the lake today were two Black Terns, one Common Tern, two Sandwich Terns (on the sluice at Herriott's Pool), one adult Yellow Wagtail, two White Wagtails, an Osprey this afternoon, and single Hobby and Peregrine. The waders were still much in evidence with 104 Ringed Plover (only four previous autumns have produced a three-figure count at Chew), 43 Dunlin, three Little Stints, six Curlew Sandpipers (including one which appears to be partially oiled and has a Dunlin-like black belly patch on one side), five Redshank, three Ruff, three Snipe, four Green Sandpipers, two Common Sandpipers and one Black-tailed Godwit. What was probably a Pectoral Sandpiper was also seen at long range this evening; it and most of the waders were pretty distant in Stratford Bay. A dull day with a fair breeze picking up, and still new birds arrive. Two Bar-tailed Godwits this afternoon with a group of five Black-tailed Godwits were noteworthy amongst a list of birds as follows: one Egyptian Goose, seven Wigeon, five Pintail, one male Ring-necked Duck, two male Tufted Duck x Pochards, nine Little Egrets, 45 Ringed Plover, just 30 Lapwing, four Little Stints, one Curlew Sandpiper, 10 Dunlin, one Pectoral Sandpiper (Stratford), eight juvenile Ruff (the highest autumn count since 2001), three Greenshank, nine Green Sandpipers, three Common Sandpipers, one Turnstone, three Yellow-legged Gulls, one Arctic Tern, two Black Terns, 700 Sand Martins, 600 House Martins, one Kingfisher, four Wheatears, and two Yellow Wagtails. The Pectoral Sandpiper was still at Moreton Point today, as were two Little Stints and a Curlew Sandpiper, and a smaller number of Ringed Plover than of late. There were still seven Ruff on Herriott's Pool, with other reports of the Ferruginous Duck and Ring-necked Duck (both Stratford Bay), one Garganey, three Greenshank, an Egyptian Goose, one Green Sandpiper, one Hobby, and five Wheatears (four on Moreton Point) - part of a small influx locally today. At least 40 Ringed Plover, seven Dunlin, four Little Stints and the Pectoral Sandpiper were still present first thing; the Pec later moved on its own to the south end of Moreton Bank, visible from Stratford hide. The little Ruff flock on Herriott's Pool had increased to seven, and a Spotted Redshank in the channel leading through Herriott's End and along the shore beneath the main reedbed was new. The male Ring-necked Duck, Ferruginous Duck and two Garganey were in Stratford Bay, and five Common Terns were also present. Other reports so far today: one Wheatear, one Nuthatch, three Yellow Wagtails, one Pintail, four Green Sandpipers and one Greenshank. 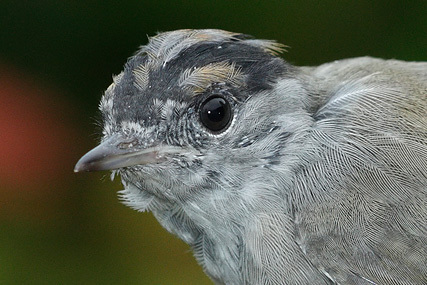 A visit to the ringing station this morning was well-timed with a fall of warblers underway; at least 50 Blackcaps were ringed. A look at their totals for the year so far showed that Cetti's Warblers have had an awful year, with only nine new birds ringed; Kingfishers are also well down, with only four ringed this year. First-winter male Blackcap being ringed. You can see he's nearly completed his post-juvenile moult - the reddish cap has almost been replaced by black adult feathers. No sooner than I had posted a photograph of a Pectoral Sandpiper on the homepage, then one should appear in front of me the following day. If only I'd put a photo of a Buff-breasted Sandpiper up instead. Anyway, the homepage shot is a bird seen at Barrow Tanks a few years ago; this evening's Pec wasn't giving such fine views on Moreton Point, with 47 Ringed Plover, seven Dunlin and four Little Stints. One of the latter only has one leg, joining another casualty in the shape of a one-eyed Ringed Plover at the point. A Wheatear was also there. The duck flock in Stratford Bay not only included the male Ring-necked Duck and male Ferruginous Duck, but also three aythya hybrids (a Ferruginous Duck could reasonably be implicated in all of them). A smart adult summer Black Tern was joined by three Common Terns on the main lake. Eight Greenshank, one Black-tailed Godwit, 90 Lapwing, six Ruff (a decent count at Chew), eight Green Sandpipers, one Common Sandpiper, five Pintail, nine Little Egrets and two Yellow-legged Gulls were also seen, and yesterday's Osprey was still present first thing this morning. A fine day at the lake. An Osprey was the highlight today, seen flying in from the north late this afternoon, and still present at dusk, sat on a pole in Spring Bay. A Marsh Harrier was again seen in flight across the lake at 17:00. In other news, the Tufted Ducks have increased noticeably in the last week, today bringing with them a male Ferruginous Duck. Both this and the weekend's Ring-necked Duck are presumably the birds seen previously at Blagdon, as is the female Ferruginous Duck x Tufted Duck also in Stratford Bay. Waders are still doing well, with three Little Stints, four Ruff (including an adult on Herriott's Pool), 43 Ringed Plover, seven Dunlin, two Greenshank and a Black-tailed Godwit. Eight Black Terns, one Arctic Tern and three Common Terns were also seen today.